Lighting A Revolution: Ink Blotter (unnumbered), "National Mazda"
Blotter: unnumbered; image number: LAR_BB2. 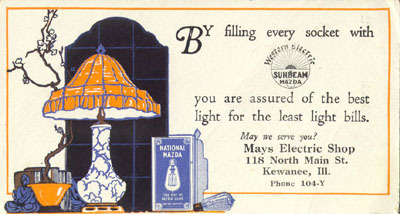 "By filling every socket with Western Electric Sunbeam Mazda you are assured of the best light for the least light bills." The elaborate licensing agreements covering use of General Electric's lamp patents included permission to use the Mazda tradename. Companies that took licenses included Westinghouse (the only "Class A" licensee), British Thomson-Houston (controlled by GE), and the member firms of the National Electric Lamp Company. Product markings reflected that arrangement: "Edison Mazda" (used by GE until Thomas Edison's death), "Westinghouse Mazda" and "National Mazda" as seen on the blotter above. The National companies were originally independent lamp makers who banded together in 1901, pooling resources to more effectively compete against GE. They built on a similar group called the Incandescent Lamp Manufacturers Association, formed in 1897 with the cooperation of GE. The National companies gained access to GE patents, and GE gained a measure of control over the competition. In 1911, antitrust proceedings revealed that GE owned 75% of the National stock and as part of a consent decree the National companies were absorbed into the larger company. Sunbeam Incandescent Lamp Company of Chicago, founded in 1889, was one of the National companies. Other participating companies included: Bryan-Marsh, Buckeye Electric, Columbia Incandescent Lamp, Fostoria Incandescent Lamp, Fostoria Bulb and Bottle, General Incandescent Lamp, and about thirty others. Western Electric, the maker of telephone and other electrical equipment for the Bell System, was not a National member but rather a distributor of lamps made by Sunbeam. As for Mays Electric Shop, the company that originally gave away this ink blotter nearly a century ago, it was established in the early 1920s by James R. May. In 1906, at age 17, May began working for Northern Illinois Light and Power. After a few years there, he started Mays Electric as an electrical contractor, but moved the business to his home during the Great Depression. His son Lester May started a wholesale electrical business (Electrical Supply Company) in 1937, "in the same home / garage as his father. "* They moved the combined businesses to the present location two years later, just a few blocks away from the original Main Street location. * Thanks to Thomas May for information (and quotes) about Mays Electric.